To finish this duo of articles celebrating this blog’s initial concentration upon Daniela Hantuchova and Tim Henman, here is an article about Tim which I wrote back in September for a sports website which has yet to launch. Henman: Free at last from a nations under appreciation…on court at least. Whatever the result it was fitting that the last on-court memory of Henman would be the arena in which the British public judged him for two weeks every year. It was fitting too that Henman’s successor was present, Andy Murray now has the burden of an even more expectant nation on his similarly built shoulders. Whether he can deal with this expectation with such maturity, grace and professionalism as Henman did remains to be seen, certainly his brittleness won’t help. Henman’s gross mistreatment by the press (almost exclusively the British tabloids) and the consequent ignorant view of Henman as a failure from a nation of football fans has of course been well documented. On the announcement of his retirement it was fellow players past and present, genuine tennis enthusiasts and the few knowledgeable tennis writers that duly paid tribute to a career ended by injury and an emphasis on power in the modern game. The question remains however; Where will Tim go now? Into the throes of the LTA? or the BBC? Most probably. A bigger question may be what effect will Tim’s background involvement have on a country’s youth who didn’t pick up their rackets during his playing peak: rejuvenating British tennis, indeed saving it from utter extinction? The hope of course is that the narrow mindedness of the populace will not hinder Henman’s chances whatever path he chooses. 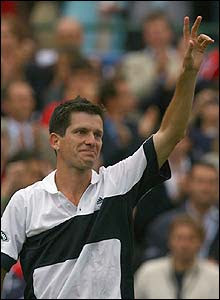 Respected within the inner circles of the LTA, highly knowledgeable and critical of the current situation of British Tennis, and clearly passionate about the state of the British game (as revealed with some vigour in his last Wimbledon press conference) Henman’s ad ministerial and promotional skills would be highly valuable, but perhaps too ‘hands off’ a role so soon after playing. First it will be family life with a third child to tend to, and the temptations of the senior tour may arrive faster than expected. A different kind of father figure role, either as Davis Cup captain or even as the tempestuous Murray’s coach, would be an ideal role for Henman, but I fancy for now if anything, he will be leaning more towards the comfy spot next to Sue and Johnny Mac for a fortnight in late June. Either way, whatever Henman’s choice, when we hear his direct and erudite commentary or read about h is strides in the revival of the sport we will remember the joy, drama and pride he gave us in his playing years. We will miss that feeling. Of course, it has since been announced that Henman will indeed soon head into a coaching role in conjunction with the LTA. Currently the ambassador for a national under-14 championship launched on tuesday Henman revealed his intentions: “I could easily see myself doing some coaching…I’ve always had good communication with the LTA, they know where I stand…if and when I’m ready I’m sure we’ll talk”. This is great news for British Tennis and is exactly the right choice for a man clearly not ready to retire to the commentary box nor the quiet senior tour just yet.